As winter ice starts to melt and spring rains begin, waterfalls around Eureka Springs come alive! 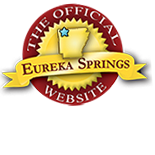 There is no better time of year to explore the woods and find great waterfalls near Eureka Springs. St Paddy Parade – Not just for the Irish! St. Patrick’s day in Eureka Springs is fun for all ages. Don your best green apparel and join us downtown on Spring Street. Turpentine Creek Wildlife Refuge hosts it’s 27th annual Kite Festival celebration March 25, 2017. “Art With an Altitude,” sponsored by KaleidoKites of Eureka Springs, is a free family event inviting attendees to bring their own kites or buy one at the refuge. The celebration includes vendors, contests and fun activities for parents and children. This entry was posted on February 10, 2017 by service424 in Family Fun, Festivals, Fun Downtown, Things to Do, Weekday Getaway and tagged Attractions, Crescent Hotel, Eureka Springs, events, Kite Festival, spring break, St. Paddy's parade, Turpentine Creek Wildlife Refuge, waterfalls, waterfalls near Eurkeka Springs.